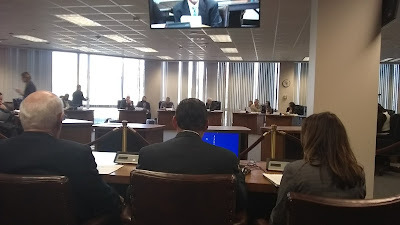 We spent this morning at the hearing for the Texas Commission on Public School Finance. The commission moved extremely slowly, to the point where they still had a couple of hours of invited testimony left when they broke for lunch. We didn't feel like waiting around any longer, so will state our thoughts here. The fundamental reality of education policy in Texas, at the moment, is stalemate. The Texas house wants to pour more money into the status quo (while lying about the tax impact). The Senate wants to empower parents and students by moving to a funding model where the money follows the student. Neither side has the votes in the other chamber to pass what they really want to do. But both sides have sufficient votes in their own chamber to block the other. The recent primary results, while modestly favorable, don't change that fundamental dynamic. Therefore: Stalemate. Given this reality, it seems prudent to scale back our ambitions. Nobody's going to get what they really want, but if people can set aside thier egos, we might be able to get something less bad than the status quo. Thus we would suggest something along the lines of modest increases in state funding accompanied by structural reforms making the existing system less bureaucratic along with a "rate compression" for local taxpayers. Increasing state funding while "compressing" local school tax rates would begin the transition from property taxes to a consumption based tax. This would be a good first step towards the Republican Party of Texas' long-term goal to completely eliminate property taxes. The key is that you must insist upon a dollar-for-dollar cut at the local level for every dollar of increased spending you have at the state level. Furthermore, if the state were to increase it's share of the total tab, it could keep the ISD's (with all of their various misdeeds) on a shorter leash. As for making the EXISTING system less bureaucratic, there are any number of ways that can be accomplished. But it's non-negotiable. Any potentinial increase in spending at the state level needs to go into the classroom, NOT the bureaucracy. Bottom Line: Given the reality of current vote counts, this sort of scaled-down proposal is the only productive thing that can pass. But a productive conversation requires a partner. If the status quo crowd wants to help devise a less-bad system, great. But if the stalemate continues, we intend to use next session to make them radioactive by the time 2020 rolls around. Given the amount of illegal electioneering in which the ISD's engaged this past cycle, any school finance bill that the legislature might pass ought to include sanctions for that sort of activity; an automatic 20% cut in state funding for ISD's that engage in that sort of behavior would stop it REALLY quick.